You still can’t see the full URL, but you can see more of it. When I click in the URL bar, it’s for one of two reasons: to copy the URL for use elsewhere, or to enter a new URL. If I want to go to one of my favorites, I’ll use the favorites bar…and if I visit a site frequently, it’s going to be in my favorites, so I don’t need those “most visited” icons there, either. With that box unchecked, nothing will drop down when you click into the URL entry area. With this change—and the other two—in place, I’m much happier with my time in Safari in Yosemite. Alas, the widening trick won’t cause the URL bar to take up all available space. It’s still has an upper limit; mine refuses to fill up the excess titlebar space I’ve got up there. Yea, it’s got a limit, sadly. This really frustrates me. :( It’s like they didn’t check with any even moderately techy users to see how people want to use it. I can guess part of the reason for the forced blank space is they removed the title bar so you need some blank space to be able to drag the window! Very sad changes all around. The URL drop down box was driving me insane. Especially because the artwork for each site wasn’t loading. I restored my favourites bar as well; much quicker. Thanks for the tip! One of the things I used at the office was Cmd click on the title bar. This took me to the folder that contained the file I was reading. It saved me having to go to search light and then search for the folder using the file name. Thanks! I hated that dropdown menu! Thanks for the tips – that favourite box was really annoying each time you clicked on that url bar. Plus enabling full url to be shown is great. Appreciate it. THANK YOU for the URL box drop down panel tip. It was sooo annoying. Sometimes I really wonder what goes through apple’s mind! Oh – and the full URL tip too. THAT was super annoying too!! If I quit Safari 8 and reopen it, it has not remember any go my preferences or customised toolbar settings. Anyone else experience this frustrating problem ? Fantastic tip to get rid of the annoying drop-down URL panel. Thanks a lot. Hallelujah!!! Thank you! I was about tired of the drop down screen every time I clicked in the URL box. I have my favorites in the bar underneath the URL box, I don’t need the darn near full screen box tile menu as well. When I am typing in the URL it is usually because I am copying an address or information from the page I am on. When that panel drops down, it ALWAYS covers up what I need to see. It was driving me insane!!! I may be dating myself here, so forgive me – but it seems like Apple is trying so hard to dumb everything down and make it have the aesthetics of social media with the bright large icon boxes and the defiling (and yes, I mean that in both senses of the word) of my photos into one large file separated by days (talk about micromanaging). It is something that I have noticed that younger (as in young teens to very early 20’s) enjoy, but not people who are looking for functionality and practicality. That is what Apple used to provide. Apple was the grown-ups PC. Now it seems to be moving backwards. As the other guy said the widening tip doesn’t work, because even if you remove the “flexible space” widgets, the URL box stays the same width. You actually don’t need any empty space to grab it. You can actually grab the little strip of space above the address field. It requires precision but you can do it. I wonder if they’ll fix the “widening” problem in a future OS update? I won’t be updating any other systems until they do. I wonder if there is a resource setting for the URL bar that can be poked — it’s so annoying that it won’t get any wider even after removing the cruft from the menu bar. My brother pointed out that in this age of retina displays that have more resolution than ever before, it’s a little strange that Apple is going to these lengths to minimize the title bar and toolbar space now. We could have really used it 10 years ago! The real answer of course is they are making desktop Safari match what is on iOS that is on small iPhone screens. Misguided to take it this far though in my opinion. Give me back a full width address field so I can view my full URLs thankyouverymuch! Is there a way to get my favorites bar at the top of the page. Wish I’d NOT downloaded this update…. Do you mean View menu -> Show Favorites Bar? hunting and hunting for how to restore the bar in safari that has also been removed. its not in any of the customizable options that i can see. 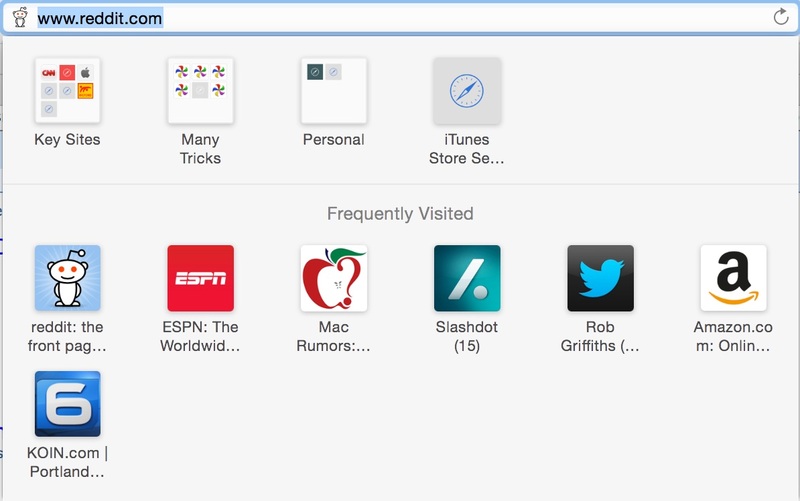 hunting and hunting for how to restore the TITLE bar in safari that has also been removed. its not in any of the customizable options that i can see. There’s no way to restore the title bar (at least not that I’ve ever heard). The title is only visible in the tab, and that’s it. It’s the same in Firefox and Chrome, too—titles have been deemed a waste of space, it seems.